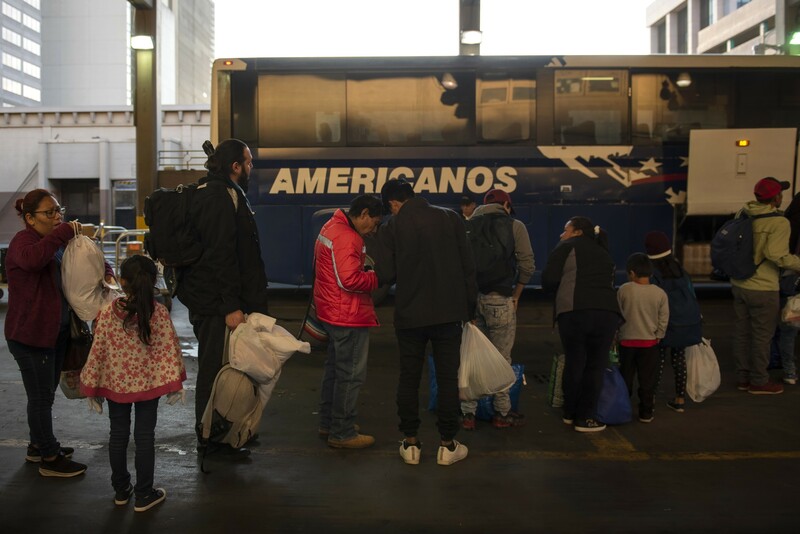 A group of asylum seekers wait to board a bus after being released by Border Patrol agents, in San Antonio, Texas, April 2, 2019. President Donald Trump said Friday he was open to releasing migrants detained at the border into mostly Democratic “sanctuary cities,” suggesting that the idea should make liberals “very happy” because of their immigration policies. WASHINGTON — President Donald Trump said Friday that his administration was “strongly” considering releasing migrants detained at the border into mostly Democratic “sanctuary cities,” suggesting that the idea should make liberals “very happy” because of their immigration policies. “We are looking at the possibility, strongly looking at it to be honest with you,” he said Friday in response to a question about the proposal. “We might as well do what they always say they want,” Trump said if Democrats do not agree to new immigration policies. “We’ll bring them to sanctuary city areas and let that particular area take care of it,” he said, adding that California welcomed the idea of more people coming to the state. Trump’s comments came a day after his administration said the policy proposal was never seriously considered. But after the president’s Twitter posts Friday, a White House spokesman said Democrats should work with the administration to welcome migrants into their districts. Democratic lawmakers do not want “open borders,” as the president has suggested. They favor improving border security, but they do not support many of Trump’s hard-line immigration policy proposals, such as building a wall along the southwestern border. Last year, Trump administration officials had floated the idea of transporting migrants to sanctuary cities, which do not strictly adhere to federal immigration laws, as a way to address the influx of migrants crossing the border with Mexico. One of the highest-profile sanctuary cities is San Francisco, home to Speaker Nancy Pelosi, who is one of the president’s top political rivals and a thorn in his efforts to change U.S. immigration laws. The White House raised the proposal again in February, suggesting it could punish Democrats for rejecting budget requests for border security. Pelosi’s office condemned the Trump administration for the idea, which the Department of Homeland Security said Thursday was ultimately rejected.